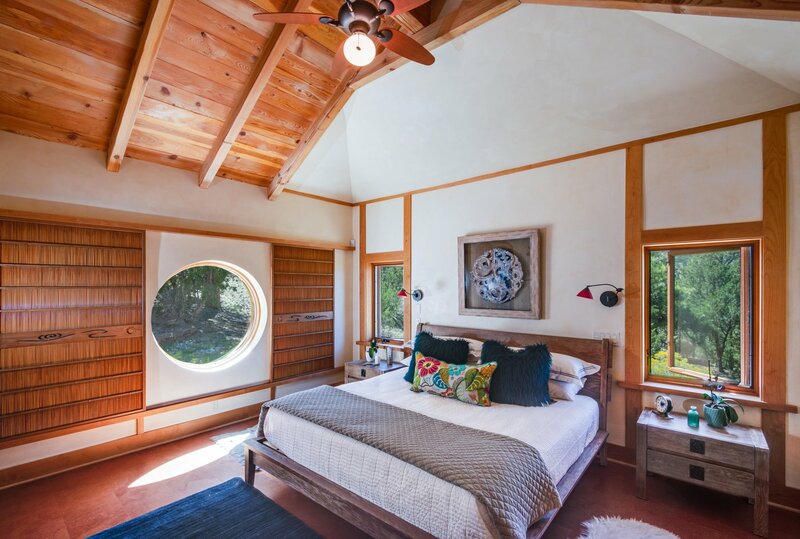 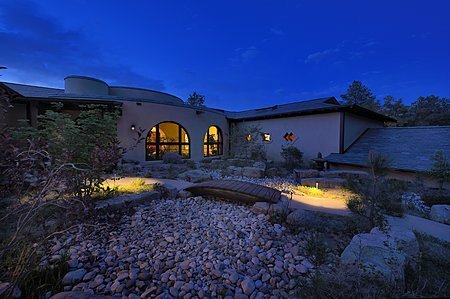 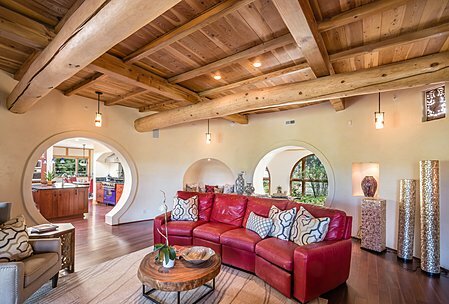 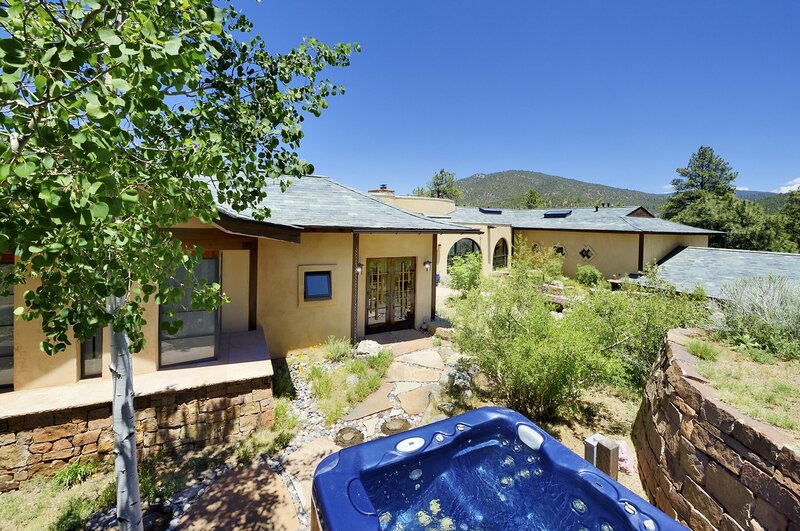 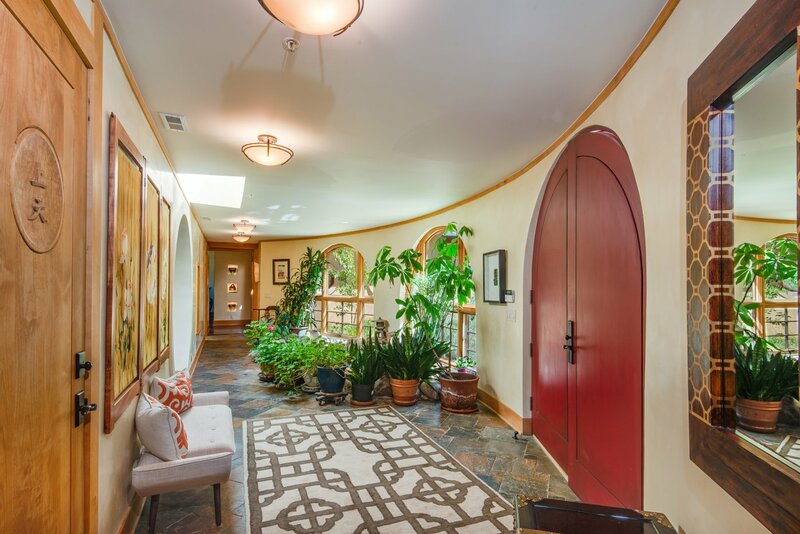 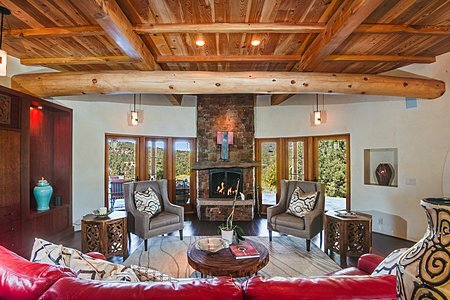 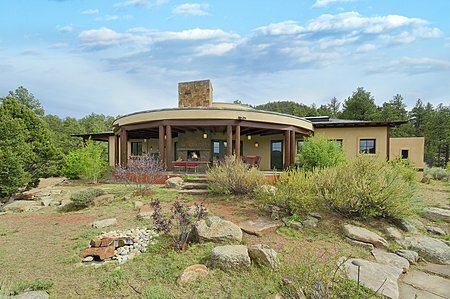 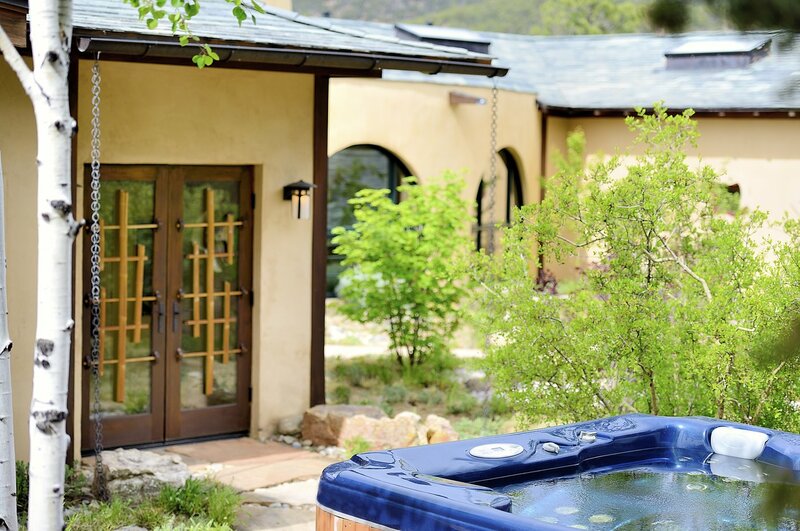 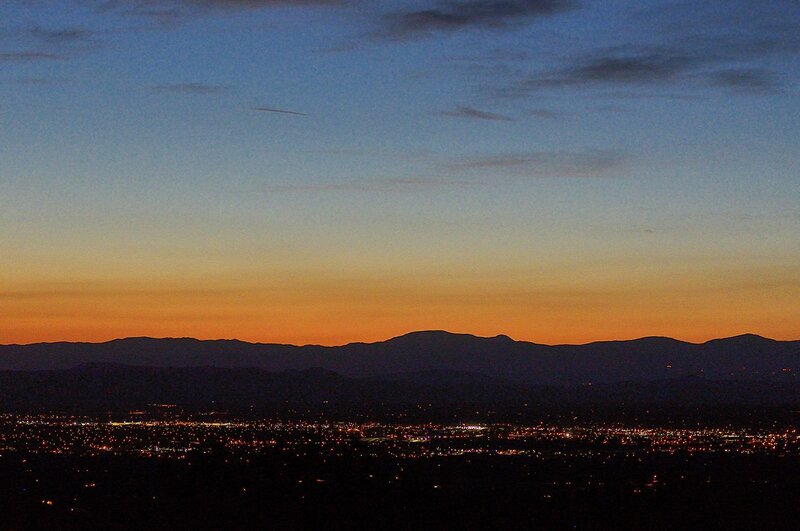 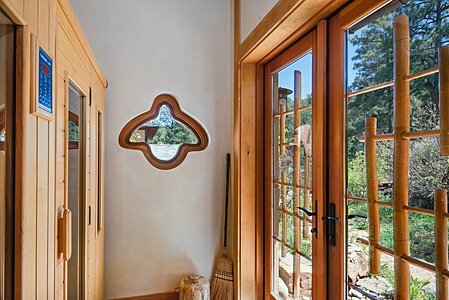 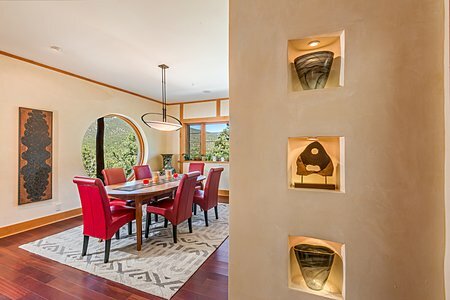 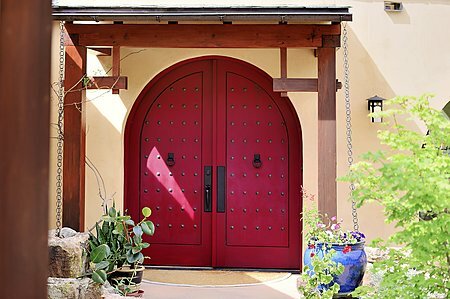 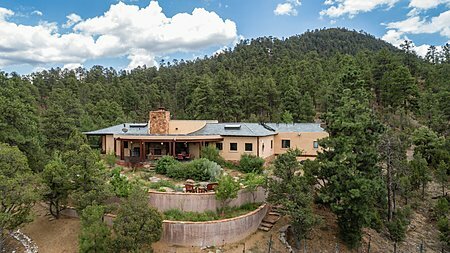 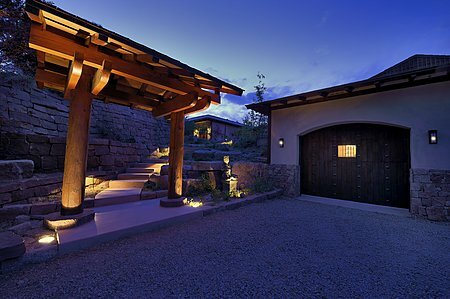 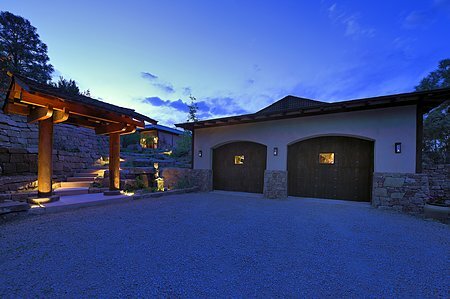 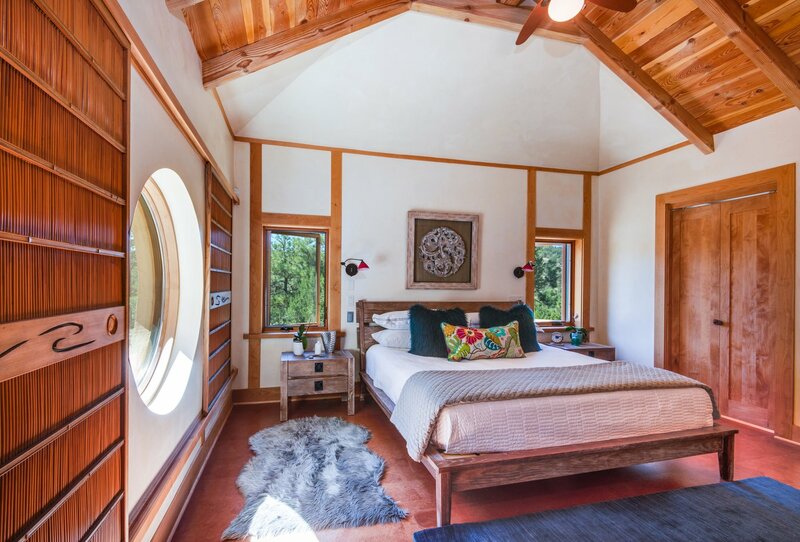 Tranquil splendor awaits in this exquisite, one-of-a-kind home tucked away in beautiful La Barbaria Canyon. 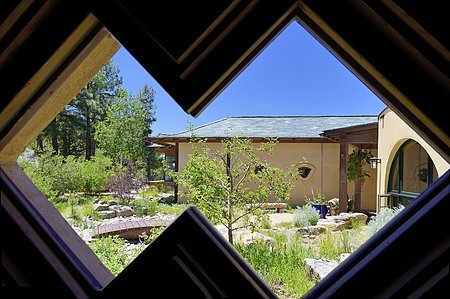 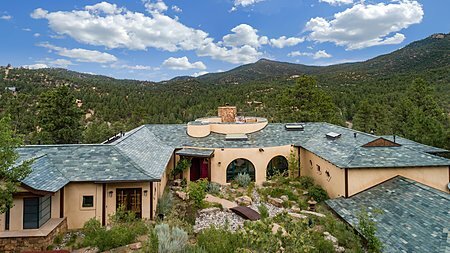 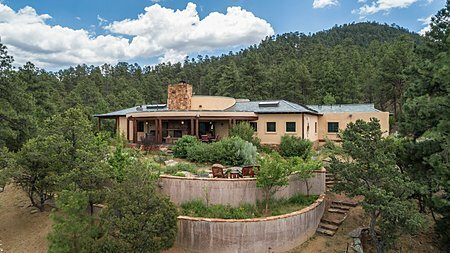 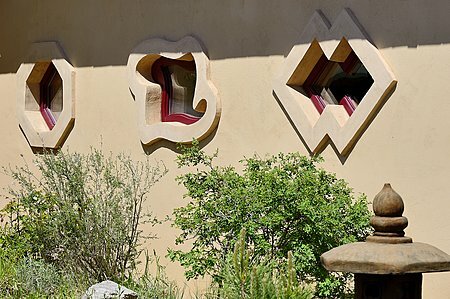 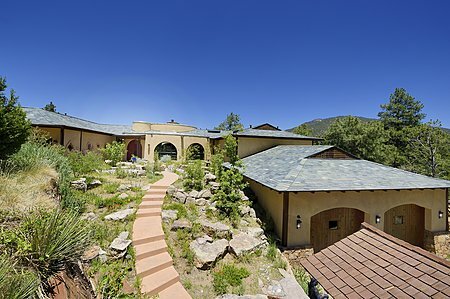 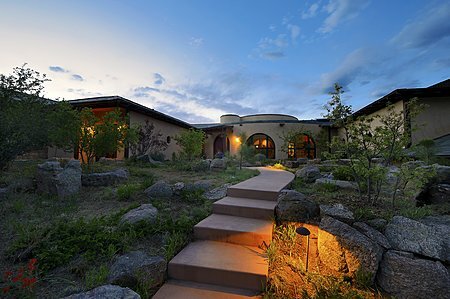 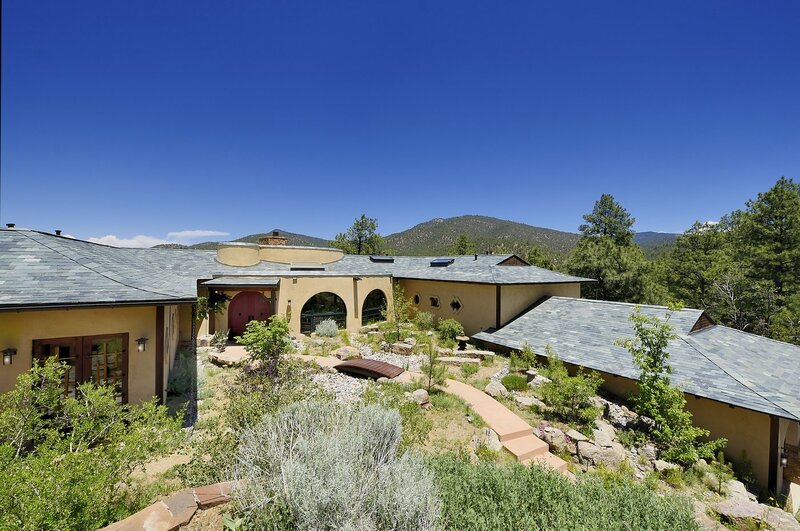 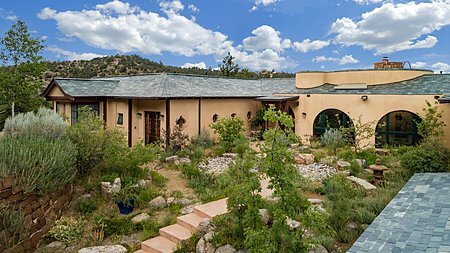 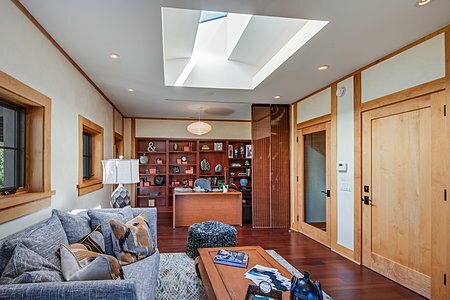 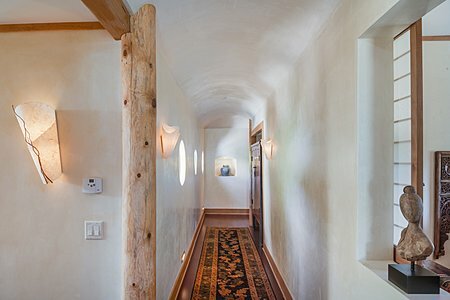 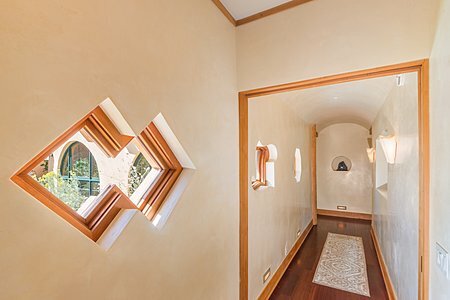 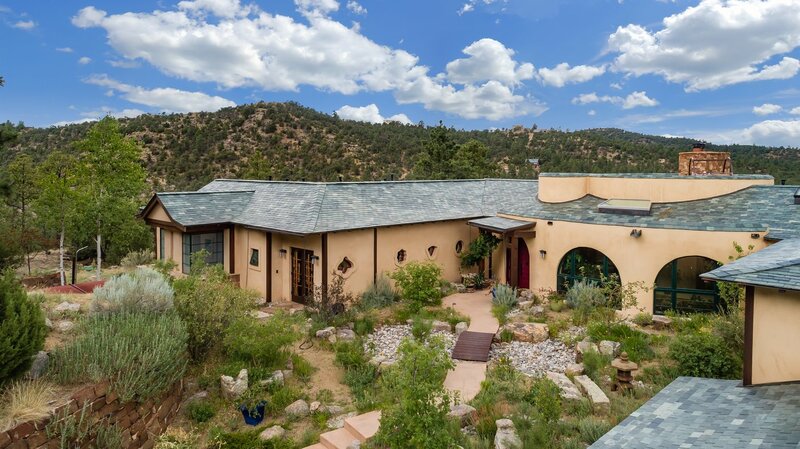 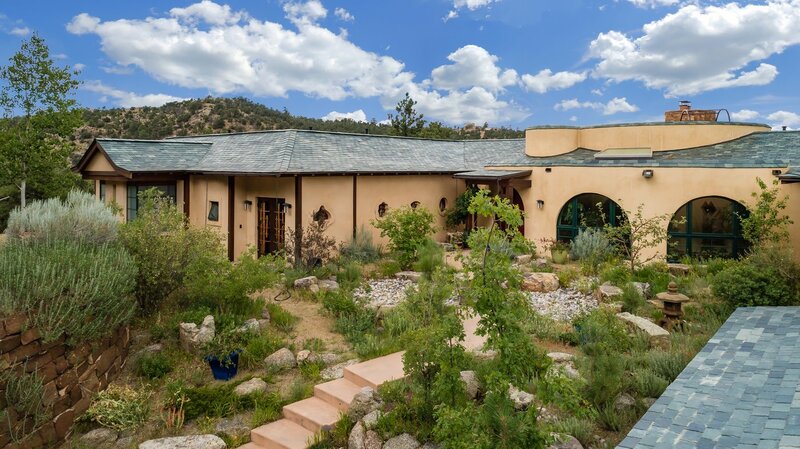 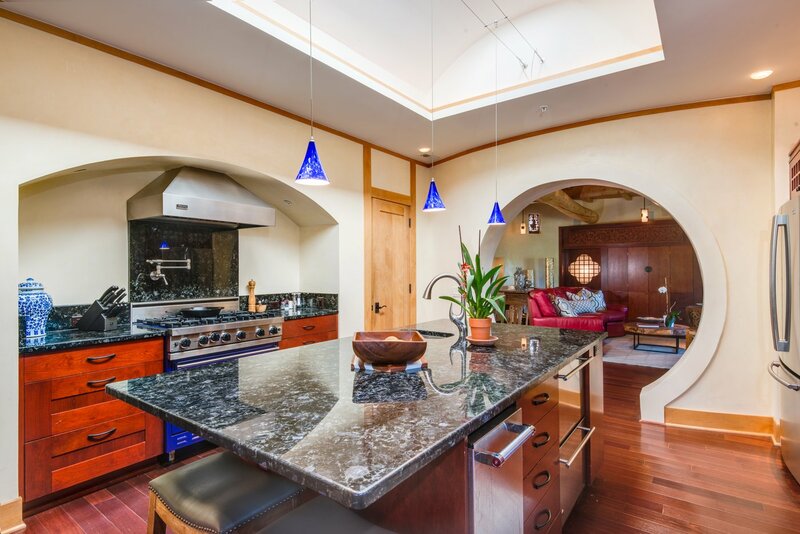 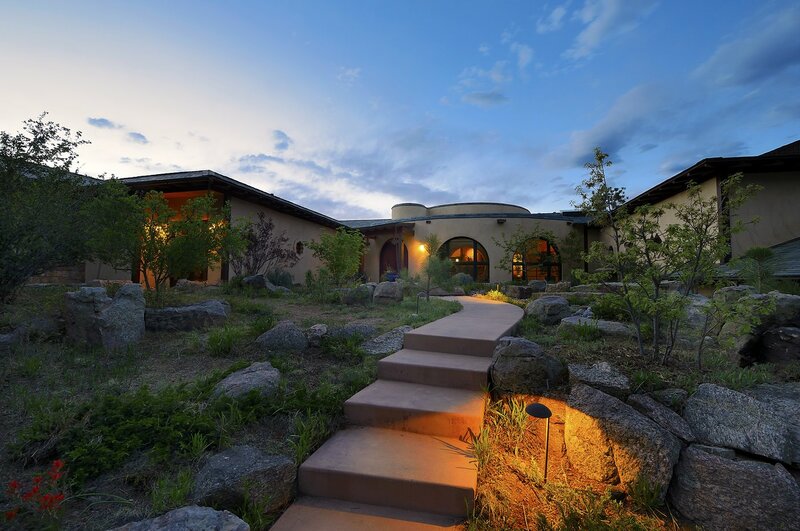 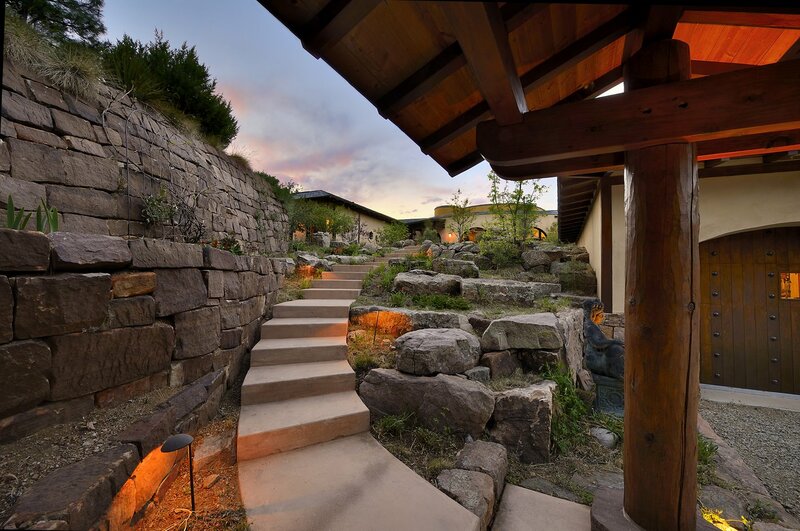 This stunning residence represents sumptuous living at its most environmentally conscious, designed with superb attention to detail by Archaeo Architects and built by renowned contractor Doug McDowell. 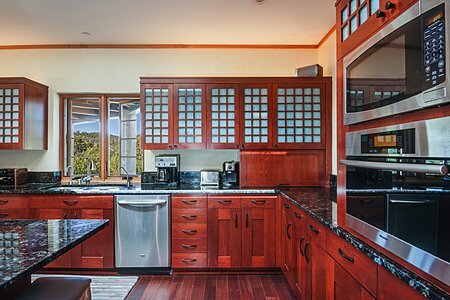 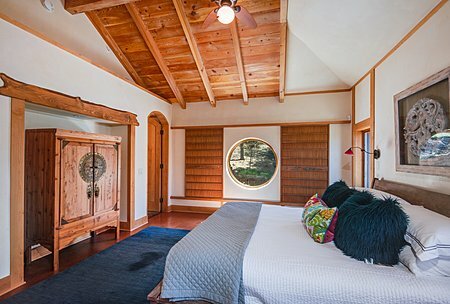 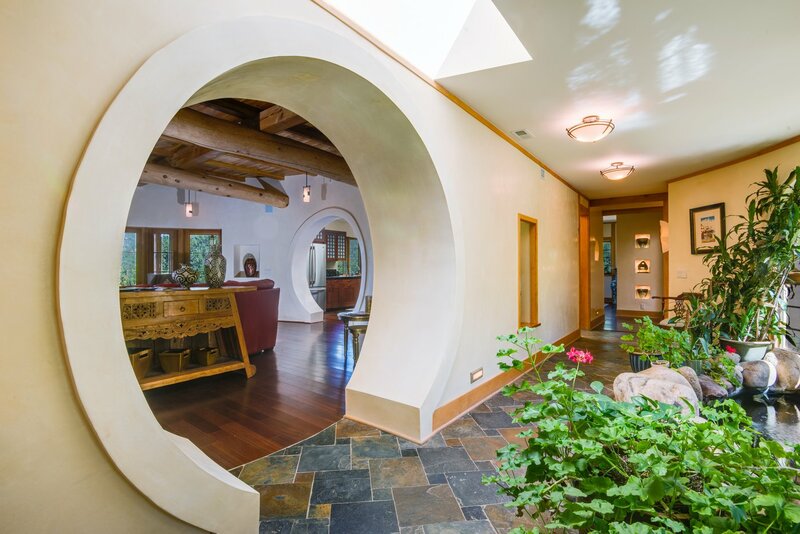 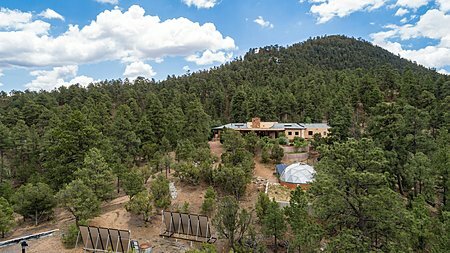 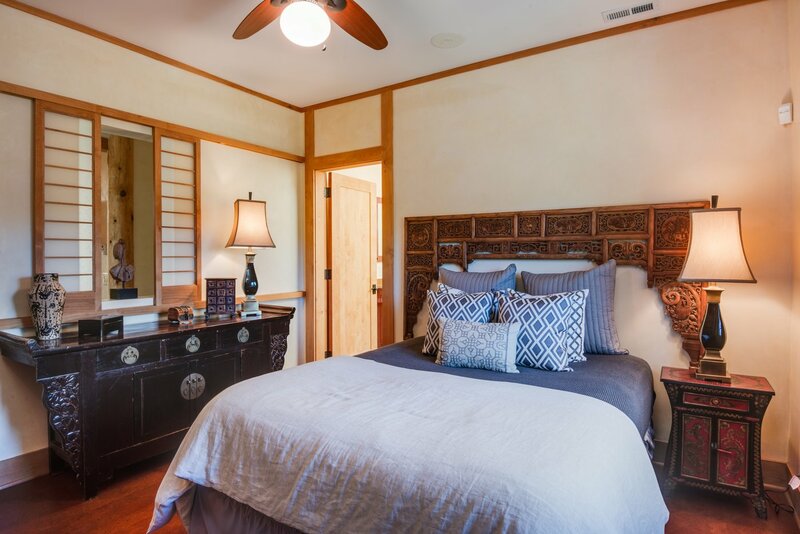 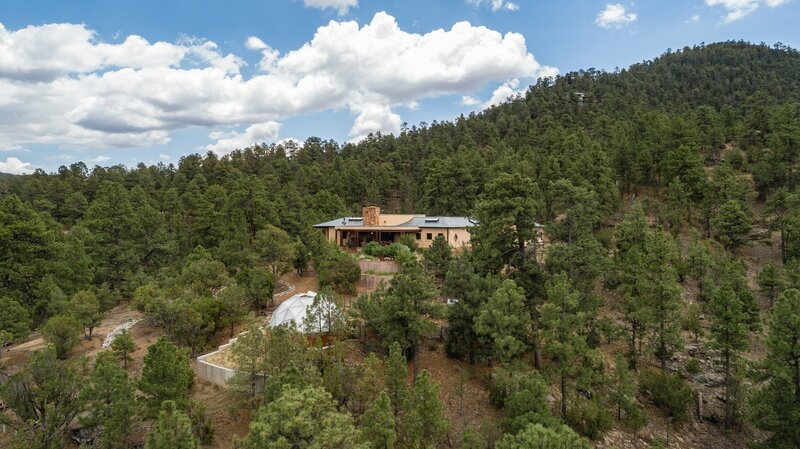 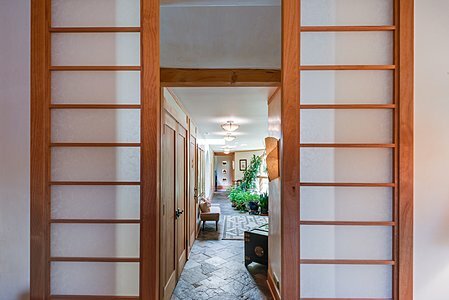 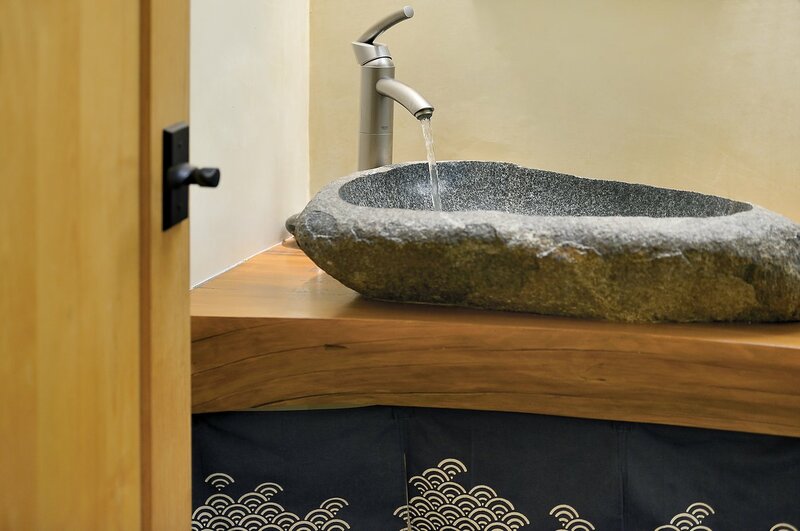 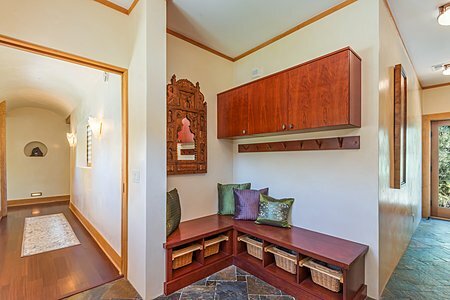 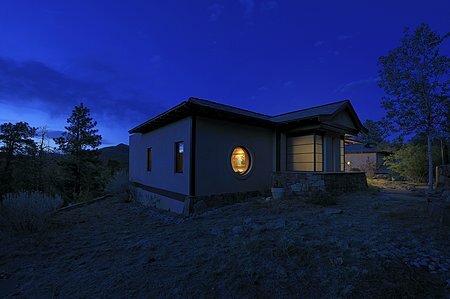 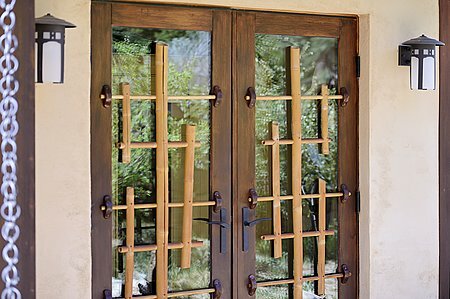 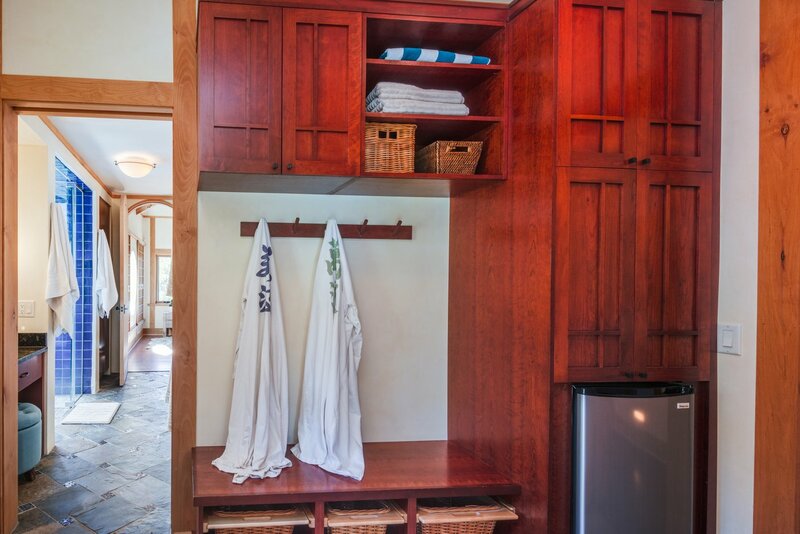 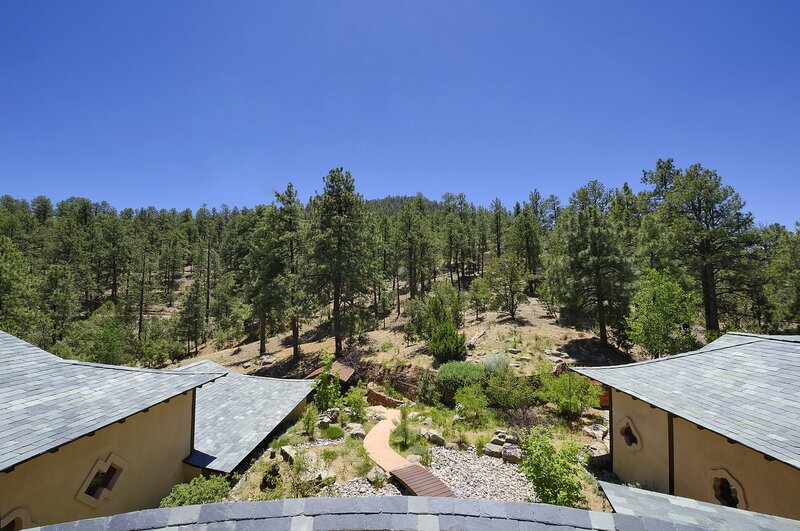 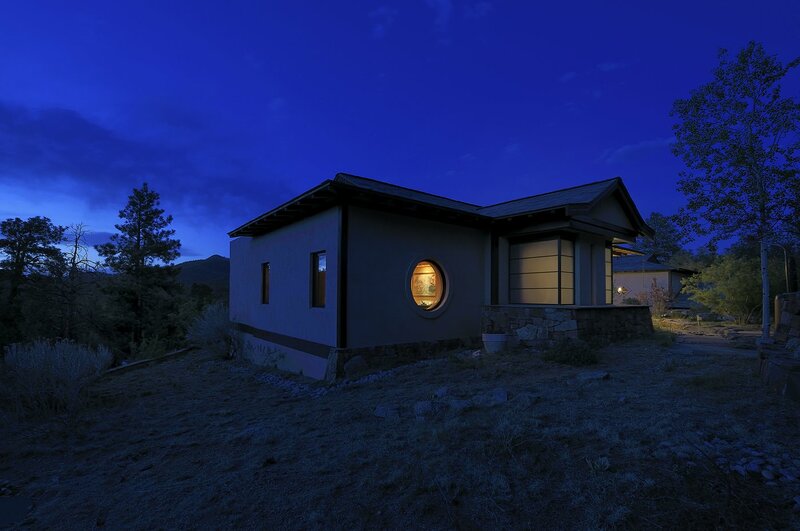 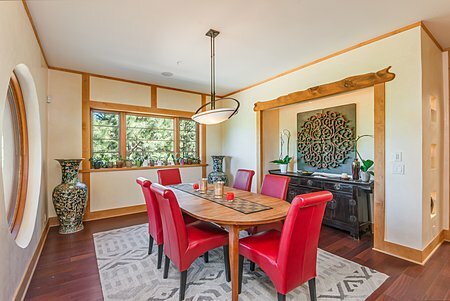 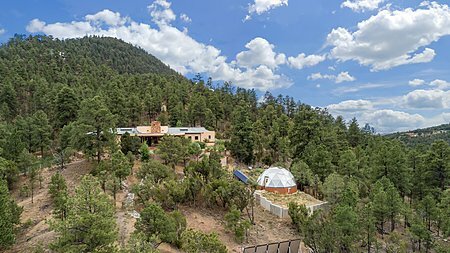 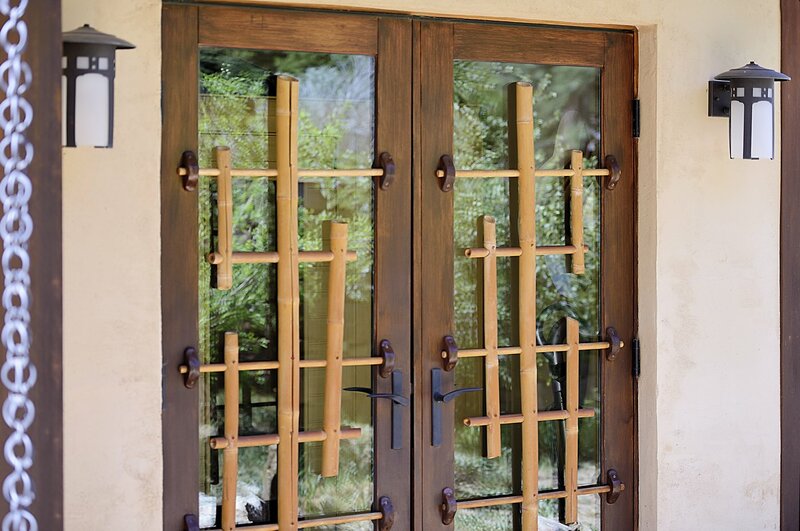 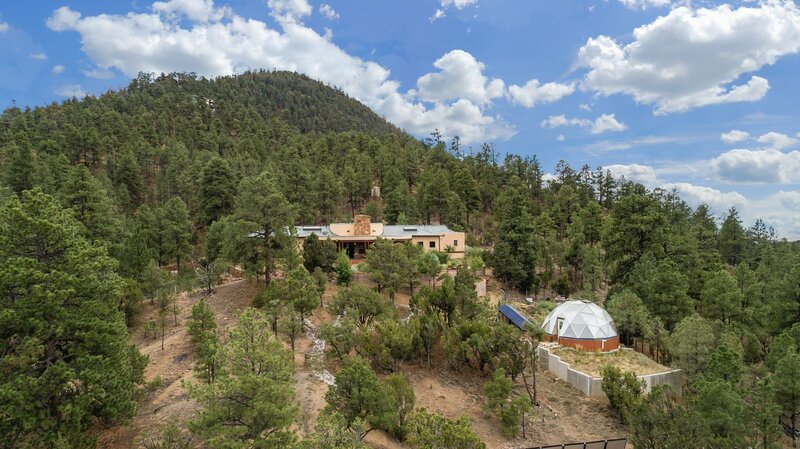 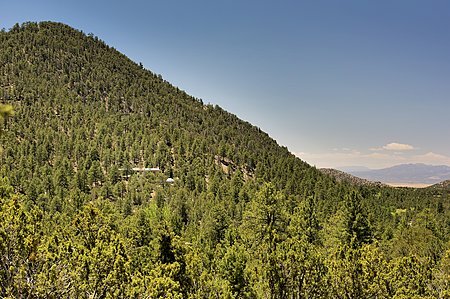 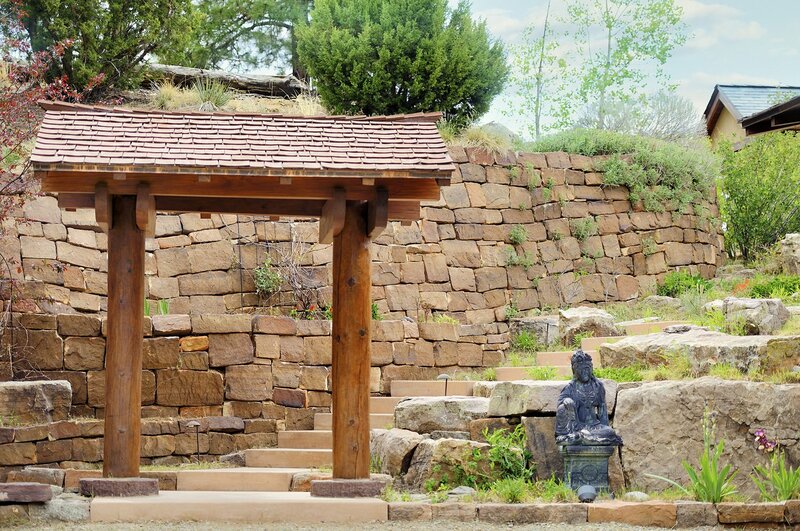 Peaceful and private, combining elements of Japanese and Chinese architecture, the house sits on nineteen plus acres of majestic pine forest just minutes from downtown. 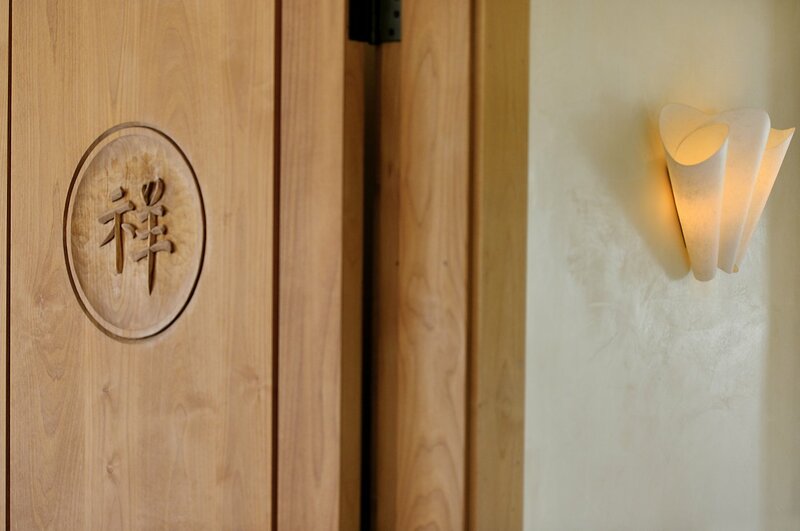 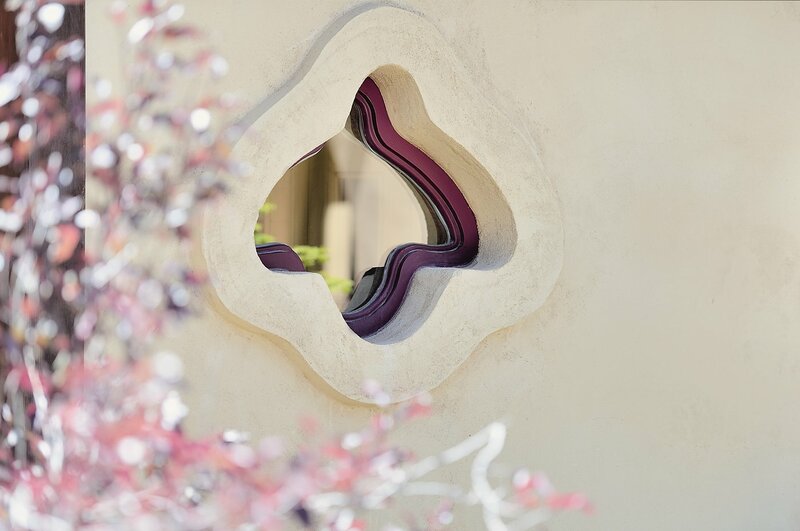 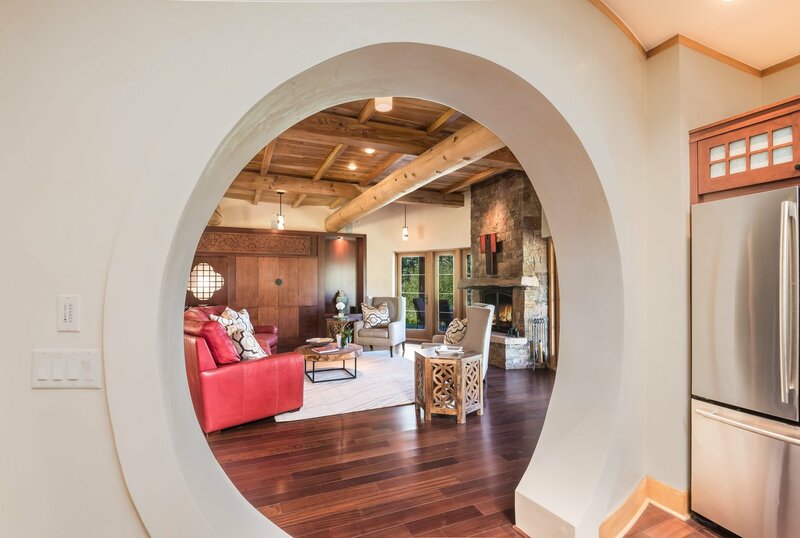 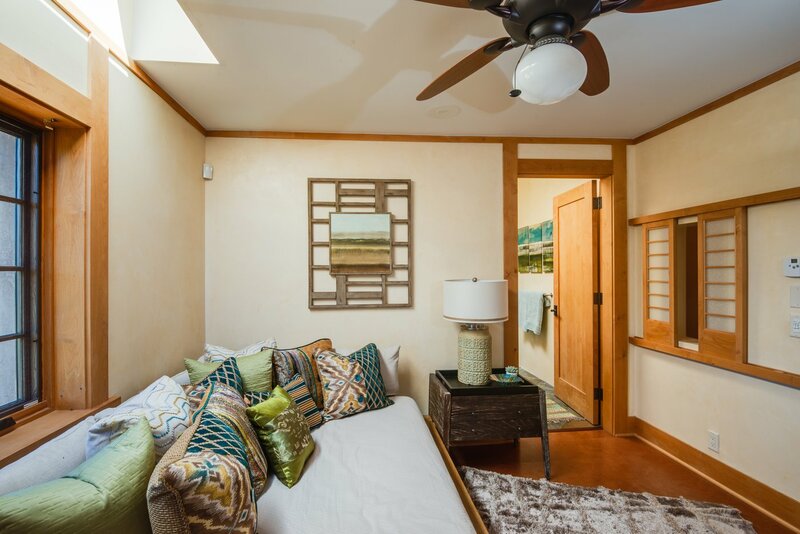 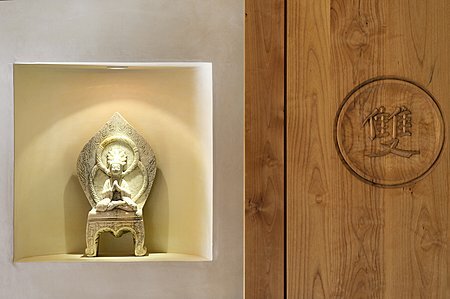 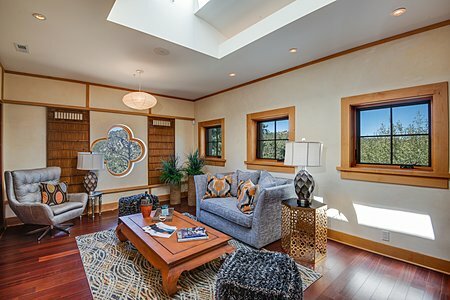 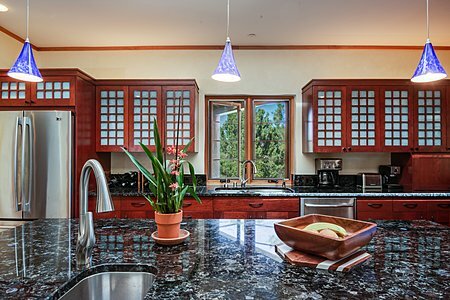 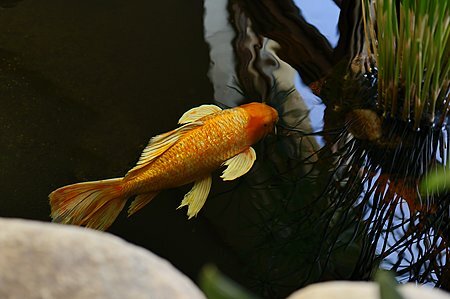 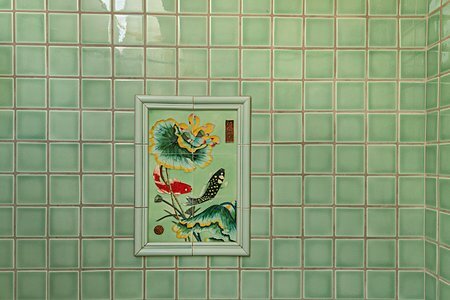 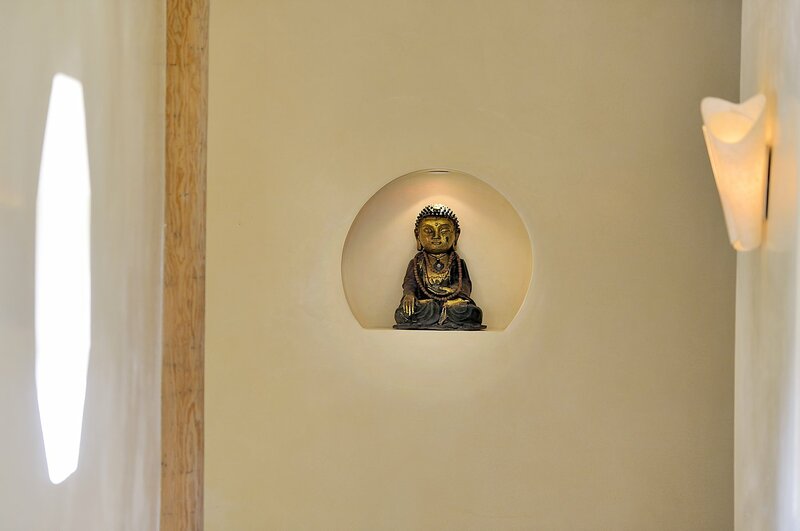 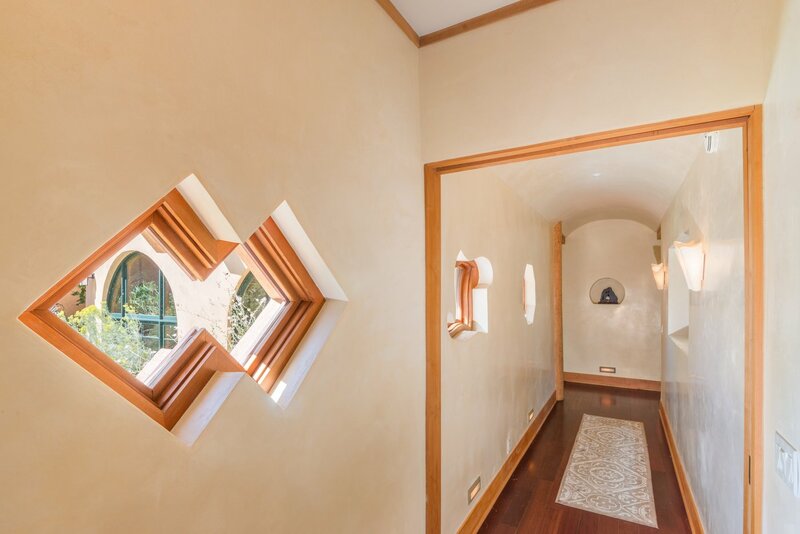 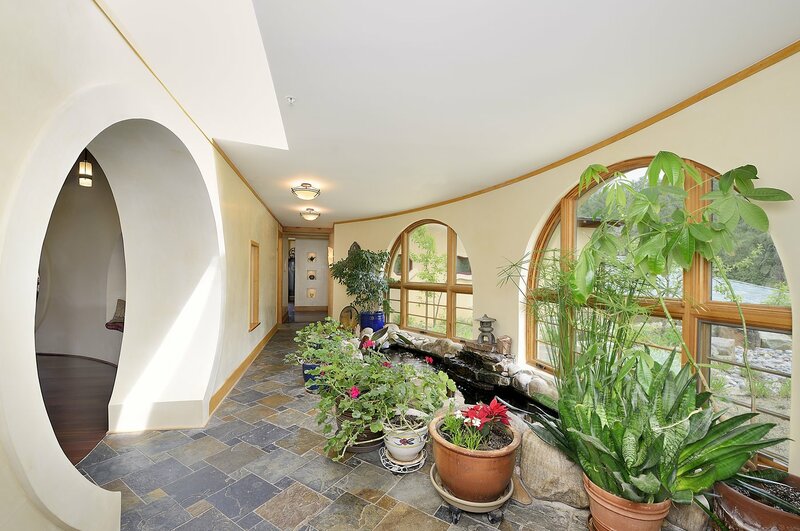 Every part of this home has been created with elegance and serenity in mind: an indoor koi pond with waterfall, natural lighting throughout, the wonderful hand-carving, custom windows, diamond plaster walls, and Brazilian cherry hardwood, stone, and cork flooring. 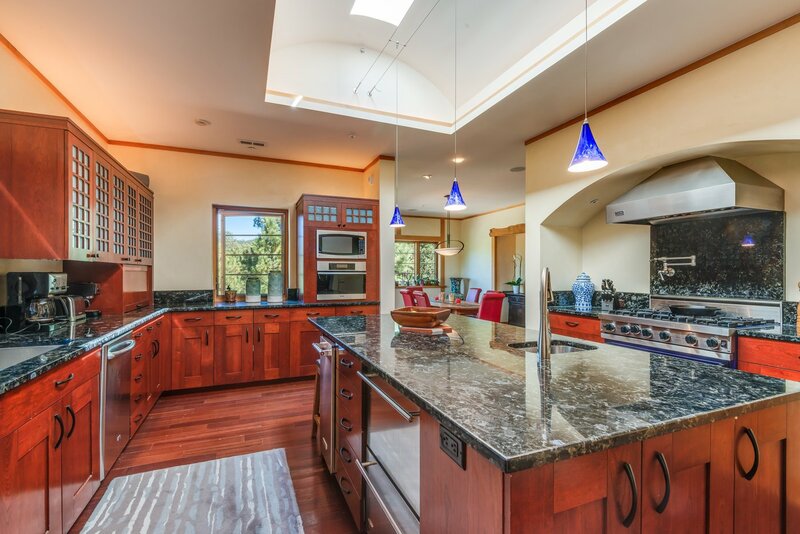 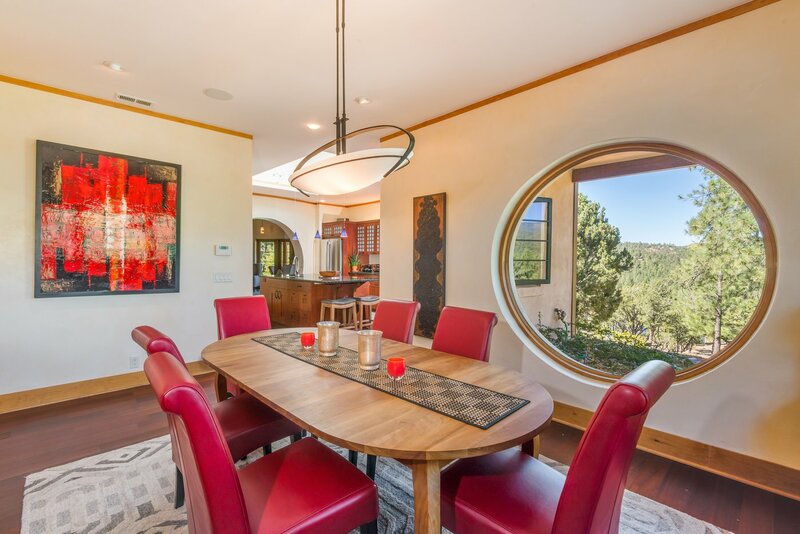 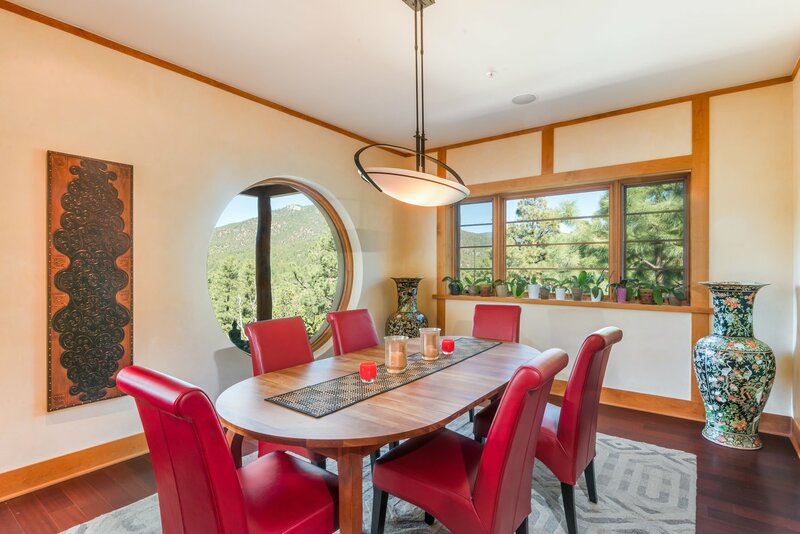 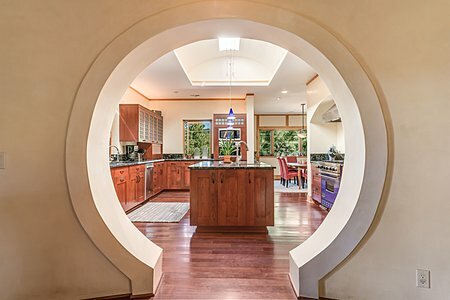 The large round living room joins an outstanding kitchen and dining room. 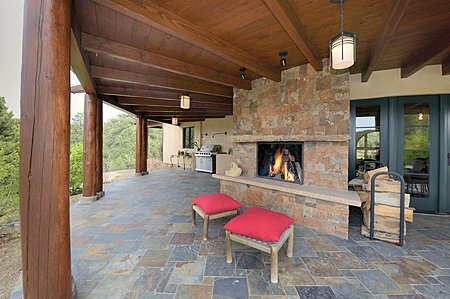 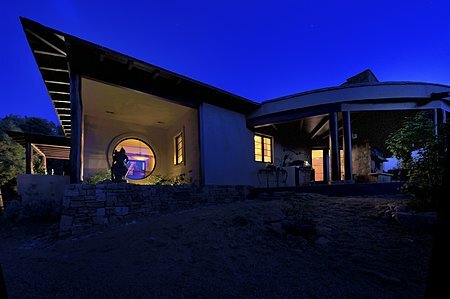 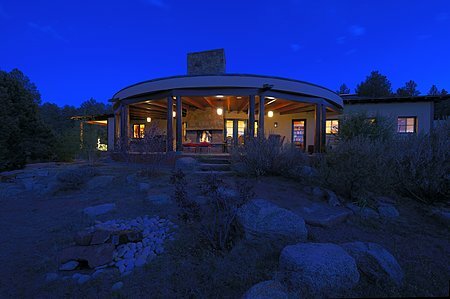 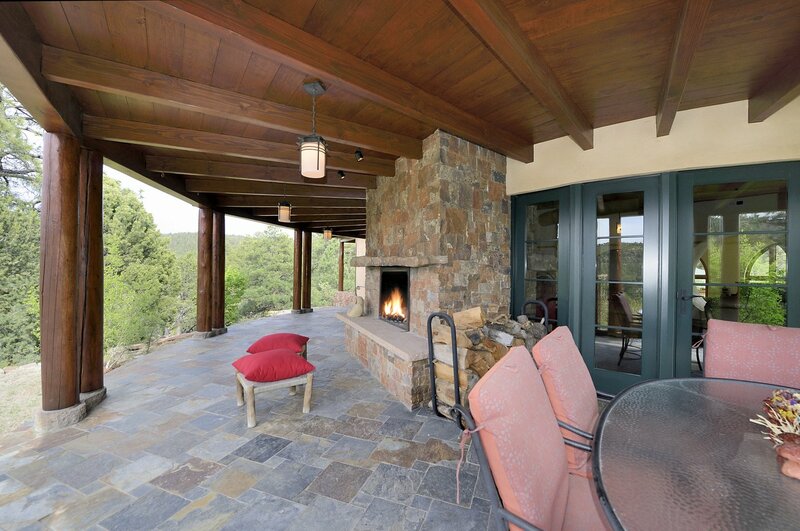 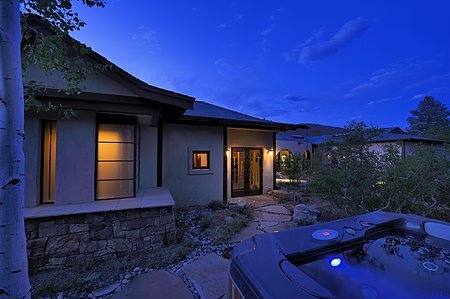 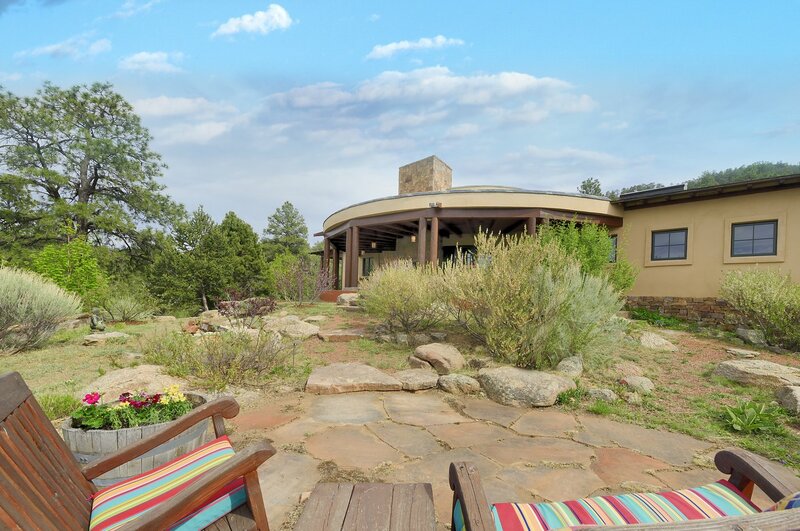 Enjoy delightful outdoor living on a marvelous wrap-around portal with a fireplace. 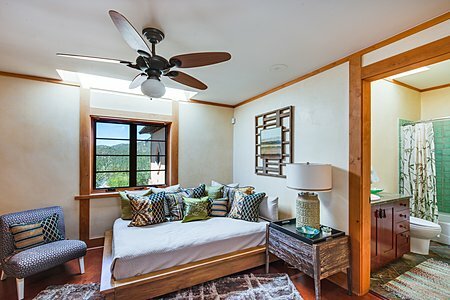 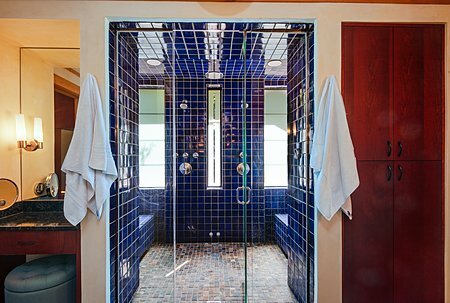 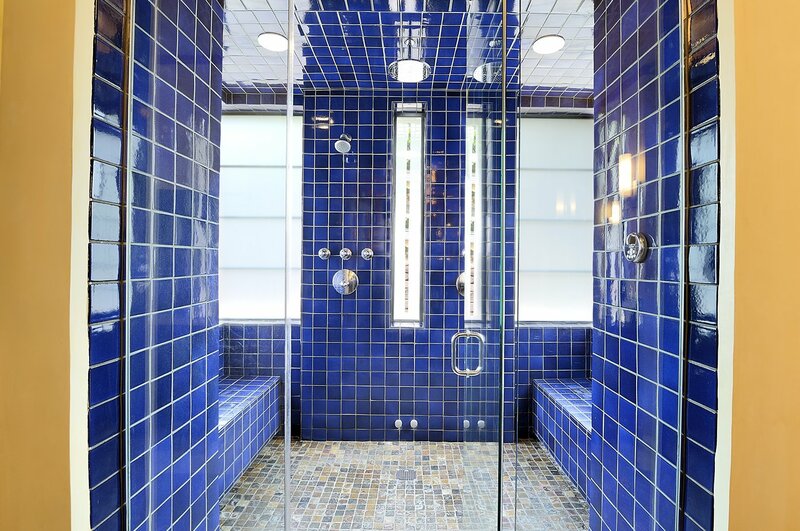 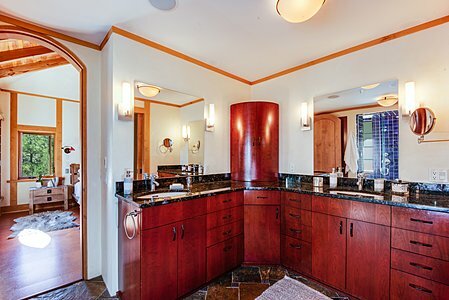 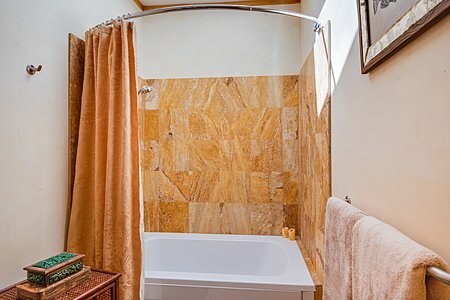 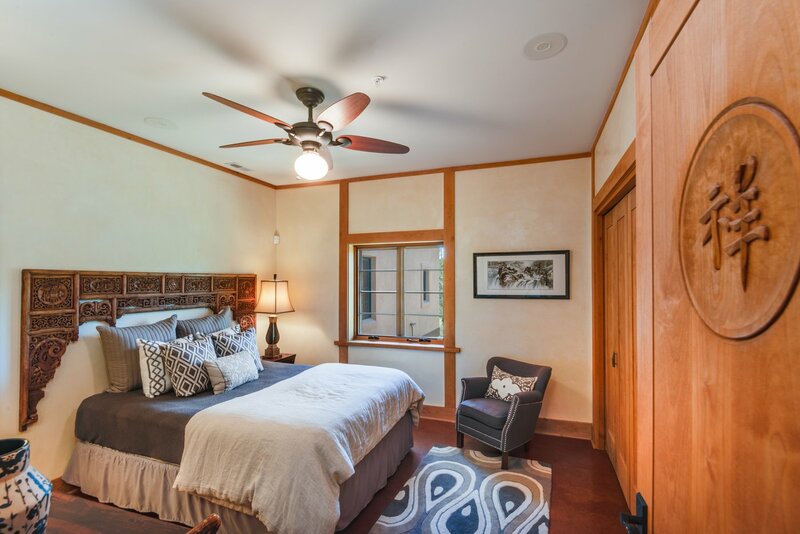 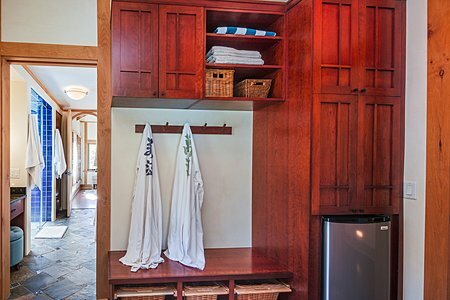 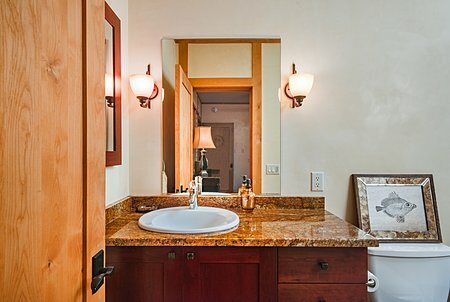 There’s a big study, and the luxurious master bath features a triple shower with steam, an indoor sauna, and an outdoor hot tub with cold shower. 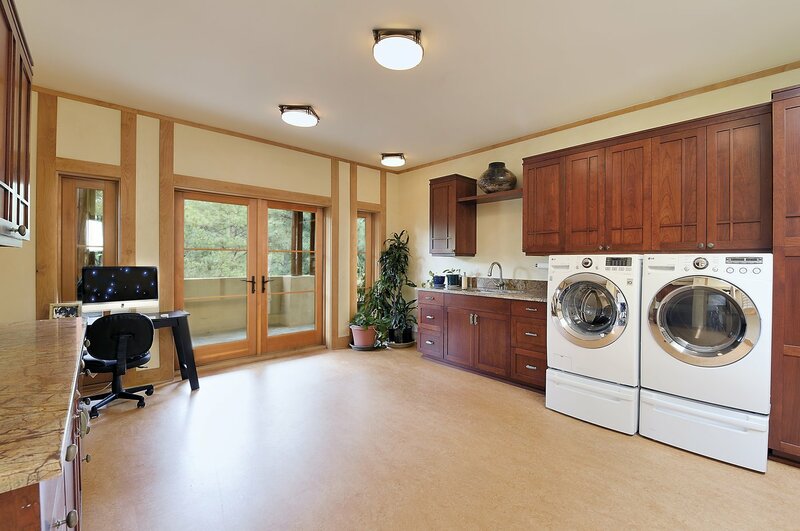 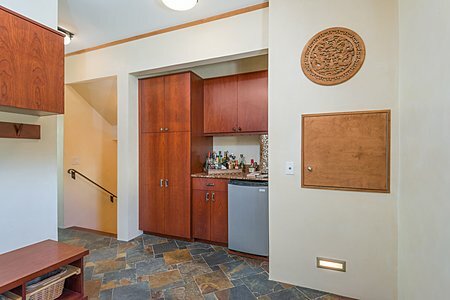 The home inside is single-level without steps, other than a flight down to the garage, which has a dumbwaiter and includes the utilities/mechanical room. 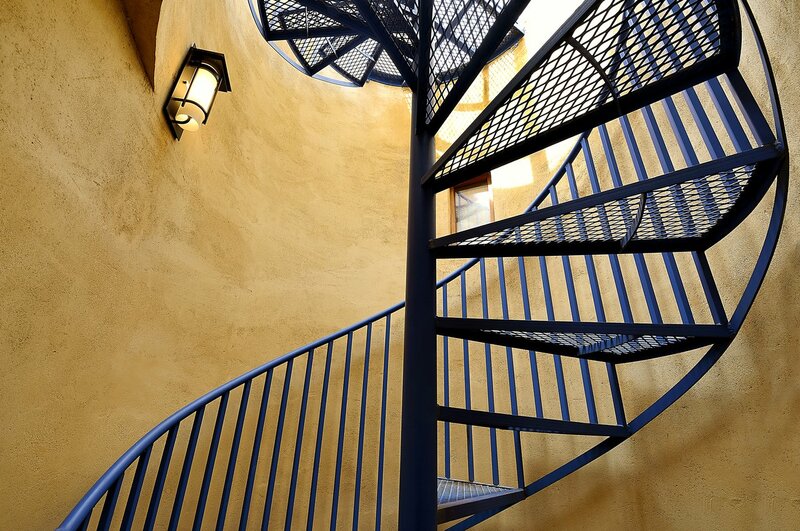 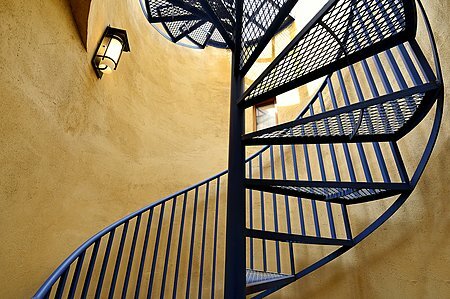 A spiral stairway in an atrium leads to an amazing roof deck with spectacular views and creates your own natural planetarium at night! The wonder of this residence extends beyond its walls. A 22-foot geodesic dome greenhouse provides food year-round, and there’s a large wine and root cellar for storing all the essentials. Two all-organic gardens outside plus peach, apple, pear, cherry, apricot, and plum trees give plenty of fruit and produce. 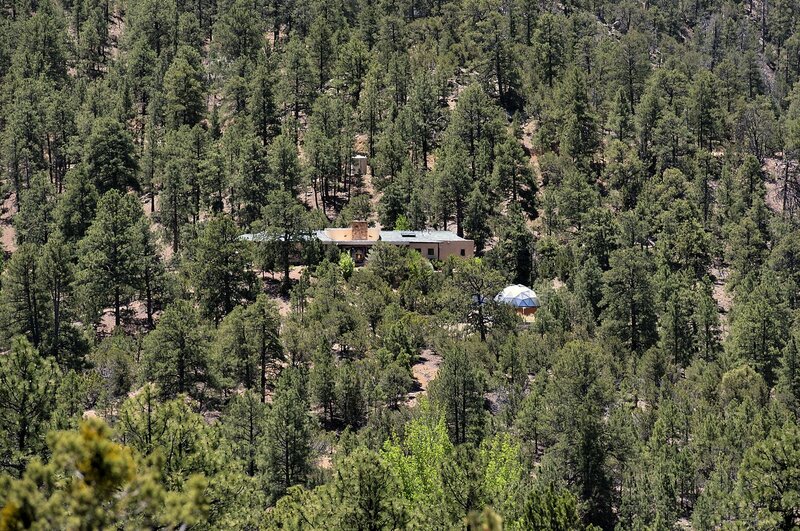 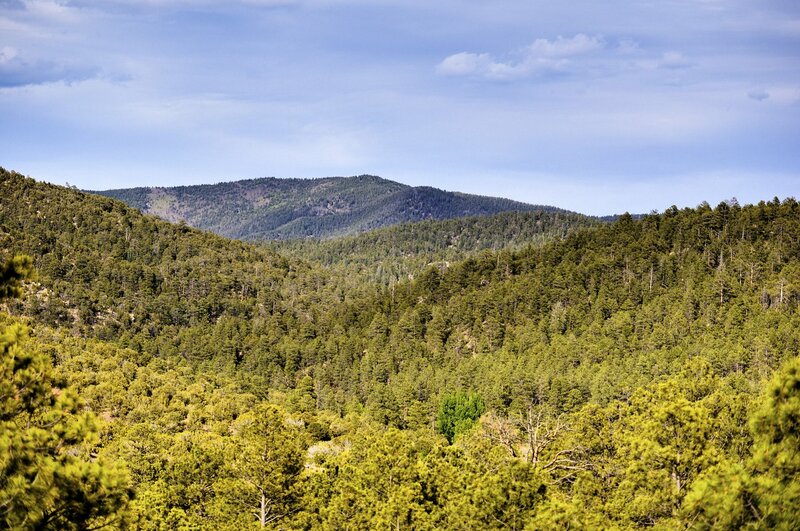 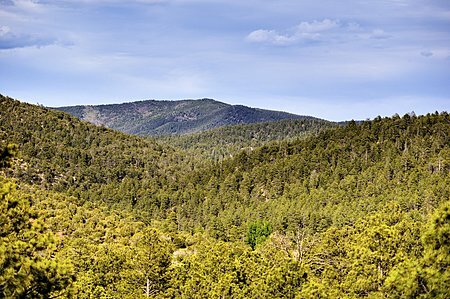 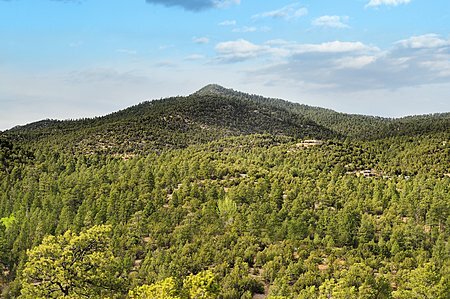 The land itself abounds with beautiful pink quartz crystals and Rosa Sophia stones in the ponderosa pine forest. The house has been constructed with the highest environmentally harmonious standards, without sacrificing luxury and comfort. 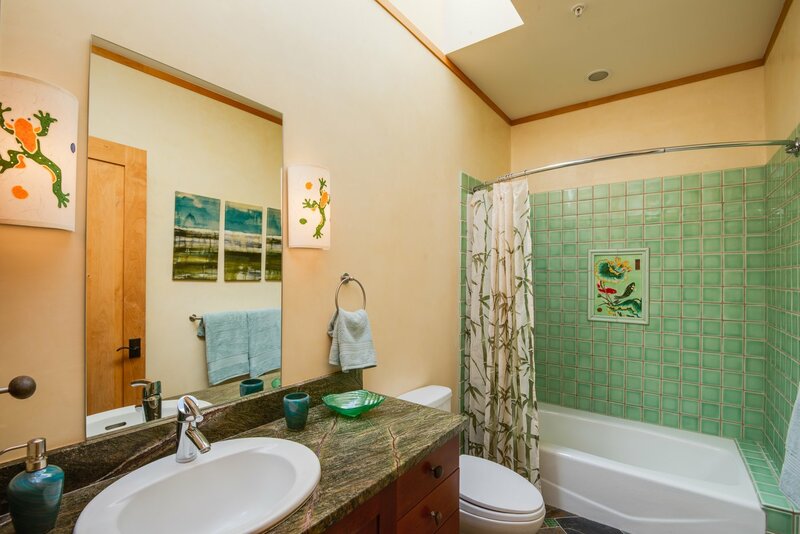 Only non-toxic materials were used, no formaldehyde, toxic glues, paints, or varnishes. 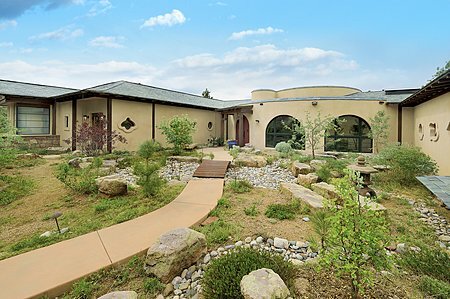 The home includes Brazilian cherry cabinetry, Bau biology home-breathable walls built with Durisol, air filtration with heat exchange, solar radiant floor heating and hot water with propane backup, solar photovoltaic panels for electricity with battery backup, Domestic water flows through a whole-house filtration system and comes from a well with solar backup power. 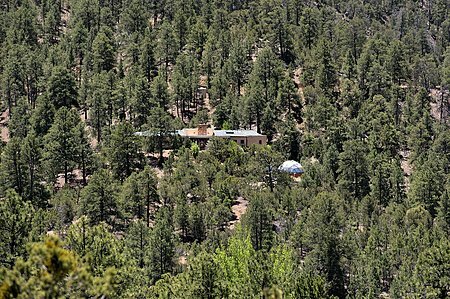 The home has security and fire suppression systems. 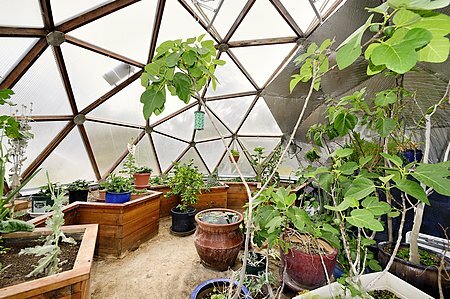 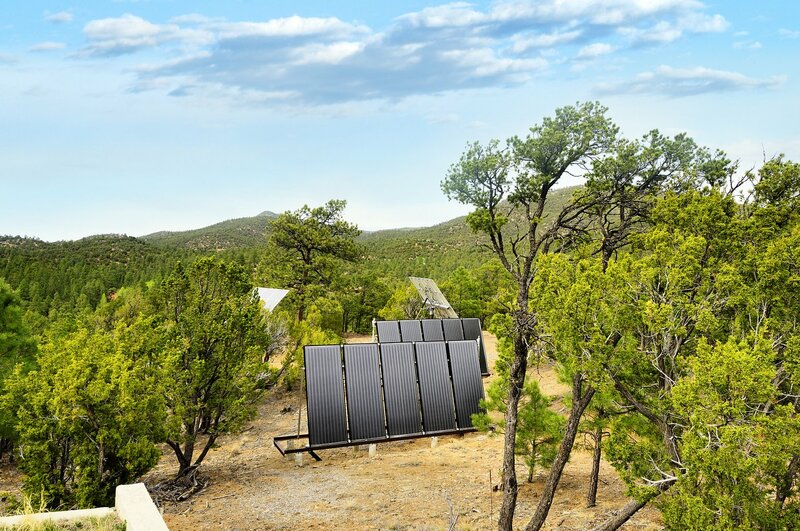 Outside, there is water catchment with filtration and UV for watering greenhouse and organic gardens, and an advanced gray water irrigation system. 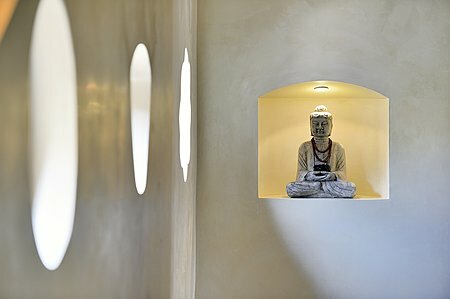 All of these remarkable features, so thoughtfully conceived and perfectly executed, create an atmosphere of peace, beauty, and extraordinary energy at this magical property.